With “The Bank Job”, Director Roger Donaldson brings us his best action movie to date. Unlike “Species” (1995) and “The Recruit” (2003), in “The Bank Job” Mr. Donaldson keeps the tension throughout and manages to construction a complicated web of blackmail and corruption. 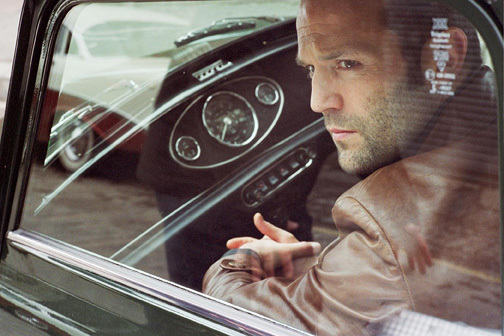 Jason Statham (Terry Leather) a former two-bit criminal is trying to go straight with his used car dealer business. However, he runs into a former girlfriend Martine Love (Saffron Burrows) who tells him about the perfect heist: a bank that will have it’s alarm system disabled over the weekend. Terry gathers his cronies and while they’ve never done something so big, they decided to go for it. If they manage to pull it off, they can all retire. The one thing they don’t know is that Martine Love’s contact is with MI5 (Military Intelligence Section 5) and while he doesn’t care much about what they rob, he wants Love to obtain the contain of security box number 118. Security box 118 holds compromising pictures of princess Margaret belonging to a man known as Michael X. Michael X uses the pictures to blackmail the courts, so he is able to run his criminal enterprise without repercussions. Terry and his gang manage to pull off the heist and steal a bunch of money, jewels, the content of box 118, and a bunch of other documents that a lot of powerful people are welling to do anything to get back. Now some of Britain’s most powerful are after Terry and his gang and Terry tries to use what he has to better his situation. While the setup of the movie was a little complicated because of the characters and situations they introduces in the first ten minutes, it all starts to make sense about thirty minutes into the movie. The setup for the heist was excellent and the heist itself is what I would call classic. The only thing about it that bothered me was that the bank robbers took a nap in the middle of the job. The casting was excellent. Everyone was believable in their role. Jason Statham took the next step in his career by taking a role that requires more than just punching and kicking to the sounds of a loud soundtrack. Lionsgate has done another excellent job with the release of this Blu-ray disk. The washed-out colors look beautiful in high definition and just about every scene looks perfect and I was unable to find a single flaw. The 2-Disk special edition also includes a behinds the scenes look, a short documentary on the actual Bank Job, Deleted and Extended Scenes and a digital copy for your PC or Mac.